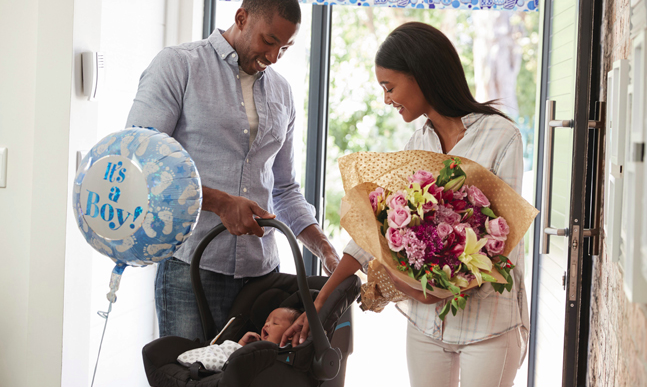 (Family Features) Bringing your baby home with you for the first time is typically one of the most exciting moments for a parent. However, preparing for baby’s arrival can be a little overwhelming at times. While there’s no one-size-fits-all manual for becoming a parent, these tips can help ensure you’re ready to bring your little one home. Setting up the nursery can be the first real “I’m going to be a parent” moment, but it’s also an important step to take before bringing your little one home. Pick a room in your home, clear it out and thoroughly clean every surface. Set up all necessary furniture, such as the crib, changing table, dresser and rocking chair or glider, then decorate the room as you see fit. Also, organize any other baby essentials you already have on-hand. Before your baby arrives, it’s easy to dismiss potential safety hazards around your home. Bringing a child into the space, however, exposes not only common safety pitfalls like stairs, electrical outlets, candles and cords but also easily accessible cabinets, heavy items not anchored to walls and sharp edges on tables, fireplaces and the like. Do a once over to install cabinet locks, foam edge coverings, outlet and door handle covers, safety gates and anchors. Once your child is mobile, it’s a safe bet to re-walk your house for new potential dangers. Your baby may arrive earlier than expected, so packing your baby hospital bag about a month before his or her expected arrival can help ensure you’re ready to go at a moment’s notice, just in case. Be sure to include copies of any necessary medical paperwork, clothing for both mom and baby – usually a few days’ worth unless the hospital is in close proximity to your home – essential toiletries, electronics chargers and books or games to help pass the time in the hospital. To bring your baby home, you are required by law to have a properly installed car seat. Whether you opt for an infant-only seat or travel system or a convertible car seat that can be used as your child grows, setting the seat up in your vehicle ahead of time gives you the opportunity to understand how to safely and securely install it. While the hospital will check your seat before sending you on your way, many local fire and police departments offer free car seat safety inspections, as well. While a new baby can cause quite the stir with family and friends vying for time to come visit, it’s important to set some ground rules in advance of your arrival at home. Decide whether you are OK with visitors just dropping by or if you would prefer to create a schedule with specific dates and times for accommodating guests. Don’t be afraid to limit the number of guests at first or to ask those who are sick to hold off on stopping by since newborns are more susceptible to illness. Find more tips to prepare for your child’s arrival at eLivingToday.com. When you’re a new parent, once you’ve successfully navigated the first car ride home from the hospital and the euphoria of this new little life begins to fade, you’re left with one resounding question: now what? Numerous studies offer evidence that a child’s learning abilities are developed during early childhood, meaning before even heading off to school. That doesn’t mean you need to reach for the flash cards right away, though. Instead, focus on simply talking, singing and playing together. These activities can help develop vocabulary and other important cognitive functions. When it comes to a baby’s gut health, the first six months are critical because the immune system and metabolism are developing and being programmed for the future. Research published in “Cell” shows good gut bacteria during infancy, specifically Bifidobacterium, plays a critical role in establishing a healthy gut. It’s estimated, however, that nine out of 10 babies have low levels of Bifidobacterium, according to a study published in “mSphere.” There is a way for parents to identify if their baby has low levels of Bifidobacterium, though, by asking three simple questions. If the answer is “yes,” chances are your baby’s Bifidobacterium levels are low. Does your baby have diaper rash or 5-plus loose, watery poops per day?